Wild Heart Wildlife Foundation arrived at the sleepy little town of Alldays on Tuesday morning 8th September at 2am, to monitor and report back on the Driven Hunt taking place on the Farm Braam. In the dark night the sky was velvety black and full of stars. It was unthinkable that such a beautiful place would be the backdrop for the killing of precious wildlife. A driven hunt is almost unheard of by the public in South Africa but have found, after further investigation that it has been going on for years. It is a highly controversial and unethical hunting method in which a line of people walk across the veld, chasing the animals towards a line of hunters sitting on raised wooden platforms. The animals have very limited opportunities for escape. Once they reach a specific area, the hunters would take aim and fire at them, with each hunter killing around two animals per day. On the road to the farm we were met by a Senior DEA (Department of Environmental Affairs) Official, Mr. Dirk Boshoff, sent there by the Director General of the DEA to oversee the proceedings. It was clear that there were mixed feelings about this hunt, and that the Department felt enough public pressure to react in a positive way by sending out additional observers. 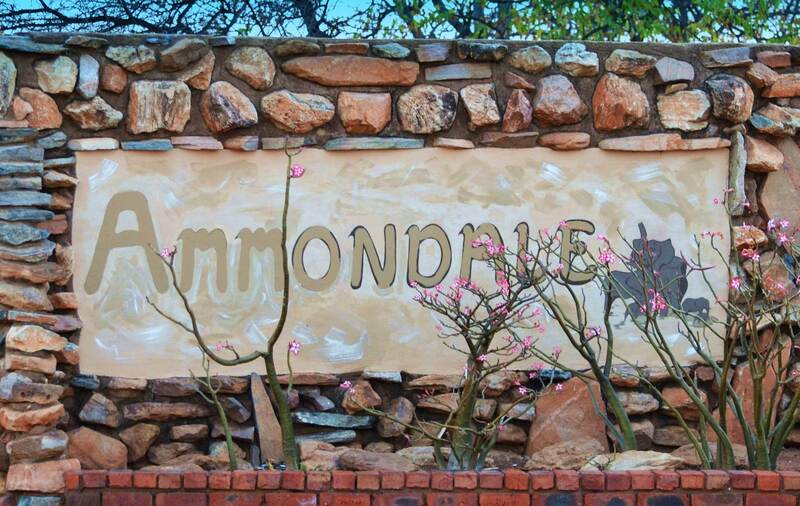 Mr. Boshoff was allowed into the Ammondale Lodge, where the hunters are staying, and was later joined by other officials from the Limpopo DEA, as well as Isabel Wentzel and another Inspector from the NSPCA. These people were all allowed on the hunt, and could form an exact opinion as to what was happening on that specific day. The NSPCA had obtained a warrant to attend the hunt, but they are still powerless to stop it, because of a kind of legal no-man’s land and lack of legislation with regards to these kinds of hunts. Pictured above is Mr Boshoff from the DEA and Isabel Wentzel from the NSPCA before entering the lodge. 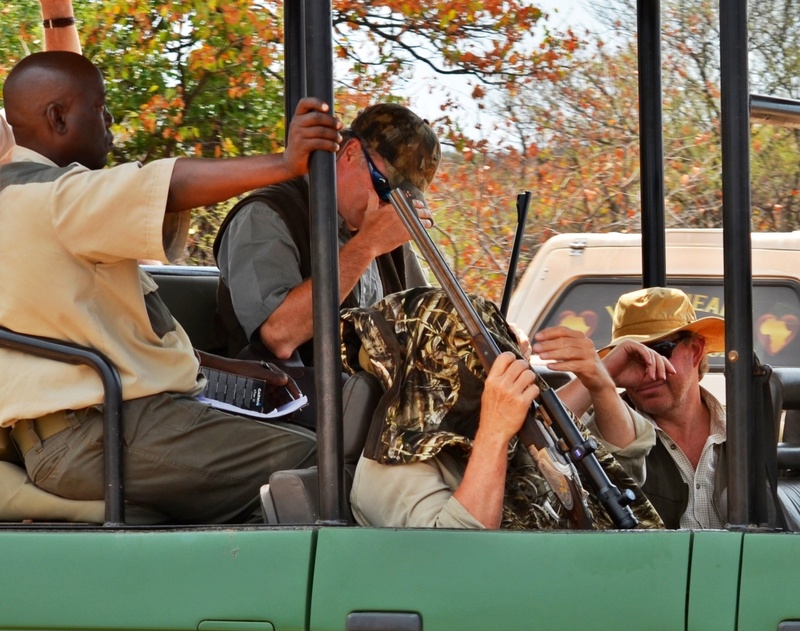 The farm was a hive of activity, with the setting up of the day’s hunt starting around 07h00. Staff were transported about, and we got to see the sniffer dog, who is responsible for tracking a wounded animal in need of being put down. 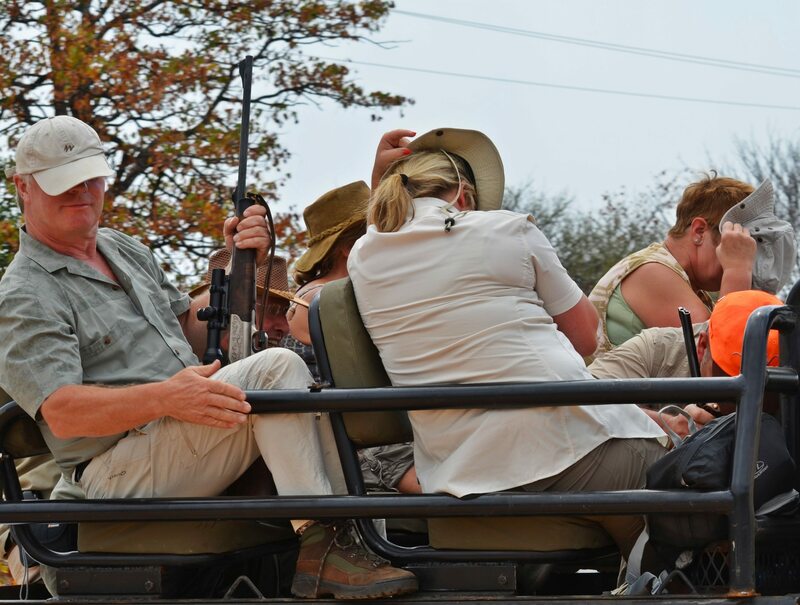 At around 07h30, the vehicles with the hunters appeared and crossed the road from Ammondale Lodge into the killing fields. There were 13 hunters, and approximately 10 PH’s (Professional Hunters), with one Hunt Master. The hunters are a mix of Belgian, Dutch and Danish nationals, and this is their blood-sport of choice. The hunters were laughing and joking, with only two of them having the decency to cover their faces in shame when they first passed. Dutch, Belgian and Danish hunters leaving to shoot the wildlife. They are a closely knit group of friends and colleagues who do not allow strangers in, and this hunt was organized specifically for them. It is apparently the first time that a driven hunt has taken place on this farm. Later on, we saw older platforms with more overgrown clearances, which suggests that it has happened here before. Elsewhere in South Africa it is secretly a regular occurrence, with hunters like these coming into South Africa on an annual basis, to specifically satisfy this kind of blood-lust. The mistake made by the Organizers of this hunt, was to place the wooden platforms in an area visible from the road. Some people who passed started asking questions, and the issue exploded in the media. The corridors with killing platforms to shoot the wildlife. The Chasers are local people employed for the duration of the hunt, to scare the animals towards the hunters. They also covered their faces as they were transported past. There were approximately 83 of them per drive. With ten metres between each person in the chasing line, this meant that almost 1km was covered by a human ‘chain’ of chasers, sending the animals straight into the shooters’ path. This was on Tuesday, and we were completely unprepared for what lay ahead on Thursday. With an initial volley of shots fired, but barely audible, a few hours later, there really was no way to know what was happening on the killing fields, as they were too far away. The farm is massive, and this explains how 600 of these platforms could have been built. The hunting area is split into smaller blocks around which the killing platforms are scattered, so only a few of these platforms are used at any time. This also enables the hunters to move to a different part of the farm, so that the animals get a chance to calm down about the shots fired around them. It makes them easier targets when they have not been shot at in a specific area recently. Two vehicles came back, with something covered in tarps on the back. It looked like large antelopes. On Monday, it was reported that 18 animals were killed, with one having been wounded, tracked and euthanized. A neighbour informed us that that it had actually been twenty animals on Monday. On Tuesday the hunt stopped at 8pm, with a total of 20 animals shot for the day. At the time of writing, it is estimated that the total amount of animals killed since Monday, was around 85. At lunchtime the hunters came back to the lodge for a break, and clouds were gathering, so hunting was seemingly ceased for the day. This time they seemed to be properly chastised, with most of them hiding their faces from our cameras. They continued to hunt, returning at 8pm on Tuesday. The hunters too ashamed to show their faces as they return from the unethical killing. Isabel Wentzel from the NSPCA who monitored the hunt on Tuesday, said that during the time that she was watching there really was no massacre, that the hunt was strictly controlled and well organized. She admitted that there is no legal precedent to refer to in this case, and that the method of this type of hunt is not ethical. In a later statement by the Deputy CEO of the NSPCA, Este Kotze, it was confirmed that they are completely opposed to this kind of hunting, and find it unacceptable and highly unethical. This remains their formal position on the matter. From the way that the events played out, it was clear that the hunters had no intention of being honest or transparent with regards to their methods. If there is nothing to hide, the press and NSPCA would have been welcomed along on the hunt. Instead, back roads were taken, video was allowed to be taken in a section where they had no intention to hunt on that day, and several of their staff participated in playing a cat and mouse game in order to confuse the public and concerned organizations. This speaks volumes about the integrity. The NSPCA was not allowed to take any video footage on Tuesday, and on Wednesday their warrant had to be enforced by the South African Police. As soon as they were allowed back on the farm, the hunters immediately packed up and left. Police arriving to enforce the warrant. On Thursday the NSPCA was not allowed on the hunting block, because that portion of the farm was excluded from their warrant. While they were chasing around to obtain a modified warrant, the hunt continued, and Carte Blanche, the Limpopo Rate Payers Association, and various animal advocates were witness to the incredible cruelty of this kind of hunt from behind the fence at a portion of the farm. The Human Chain of Chasers started right at the fence, in a line as far as the eye could see. They then move forward, chasing the animals into the sights of the hunters. Literally a few seconds after they started walking, the first shots rang out. 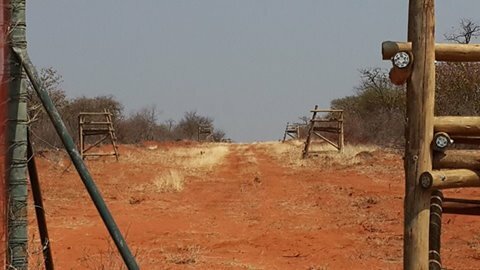 The hunters were situated about 200m from where the chase chain started (at the fence). The 83 people (Beaters) stretching a kilometer long preparing to chase the wildlife into the line of fire. While spending time in Alldays town, we spoke to several of the local lodge owners and staff. Every single person in this pro-hunting town we spoke to, said that they do not agree with this, and that they are losing business as a result of a controversial hunting method that should never have been allowed in the first place. One of the ladies we spoke to who works in one of the restaurants is a mother to some of the individuals working in the chasing line. She had begged them not to do it, because their safety could not be guaranteed with the chasing line and the hunters so close to each other. It was heart-warming to see that the Limpopo Rate Payers Association are opposed to this, and sent people out to protest on the farm. The good people from the Rate Payers Association of Limpopo giving their support. Also on Thursday, we met with a previous owner of the farm, who comes from a hunting family. He built Ammondale’s signature rock Entrance with his own hands. He was extremely emotional, and very upset about what was happening there. He said that it was not hunting, but just shooting taking place there. He came with his son, to say goodbye to a place they loved, vowing to never return. Wild Heart Wildlife Foundation maintains that just because it is not illegal, it does not mean that it is ethical or morally justified. This is nothing but a canned hunt, in that the center animals have no means of escape, and are being driven into the face of death, where they would not have been normally. If the organizers had nothing to hide, they would have invited press to attend, and the NSPCA would not have needed a warrant to obtain entry. It was later reported that a total of 98 wild animals had been killed including two Duikers that are a small antelope not much larger than a domestic cat. The fact is that currently this type of killing is not illegal in South Africa and until legislation can be introduced, this will happen again and again. It has been reported since the Driven Hunt that the DEA have taken this issue to the highest level which we are following up on very closely. As yet we have had no formal response. Anton De Vries: Hunt organizer. The subsequent television exposé of driven hunting has established a disturbing link between the agricultural and hunting sectors. The link is Anton de Vries – a Dutch businessman and fruit exporter whose companies SAFE & BONO are strategic partners in the government’s agrarian land reform policies. After De Vries was exposed on television for the driven hunt in Limpopo, the SAFE and BONO website was shut down. At the time, De Vries was available for comment. But shortly after their activities were exposed on SABC News, their PR firm made contact, requesting that their clients be given the right of reply to the serious allegations leveled against them. SABC will afford them the opportunity to defend themselves – a right that was not given to the terrified animals herded and slaughtered in Limpopo two weeks ago. Thus far he has not appeared to explain himself. The full version of this investigation will be broadcast on Special Assignment, Sunday, 4th October at 8.30pm on SABC3. We are very pleased that this cruelty towards wildlife has been reported in over 25 news papers, web sites and TV stations internationally. Public outrage is powerful. Lets make it count. Since this so called hunt was exposed it has been confirmed that Mpumalanga Province will no longer issue Driven Hunt permits. A win for wildlife due to public outrage. Wild Heart Wildlife Foundation would like to thank everyone who made it possible for us to attend and report back on this issue. Public awareness is key in stopping such atrocities devastating our wildlife. Please share and make people aware.